I randomly select the scenario (Line breaker) and we roll off for choice of sides and turn. Adrian wins and elects to go second. 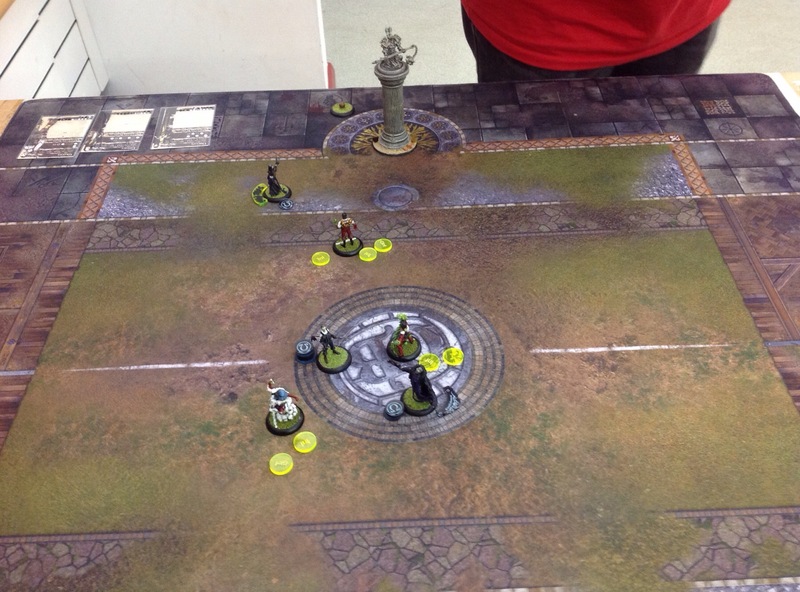 Heirarch Severius and the faithful take to the field facing off against Hexeris and his horde. As the Choir sing the Hymn of Passage, the Menite Jacks advance, camping a Focus each for use with Oracular Ability just in case. 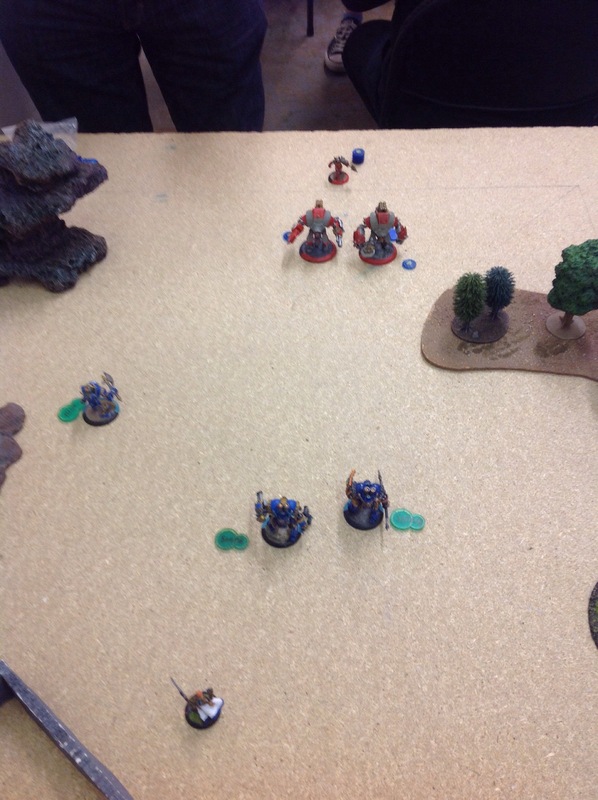 The Temple Flameguard advance to the trench and drop into Shield Wall while Rhupert plays Dirge of Mists and Sevvy puts up Arcane Ward on them. 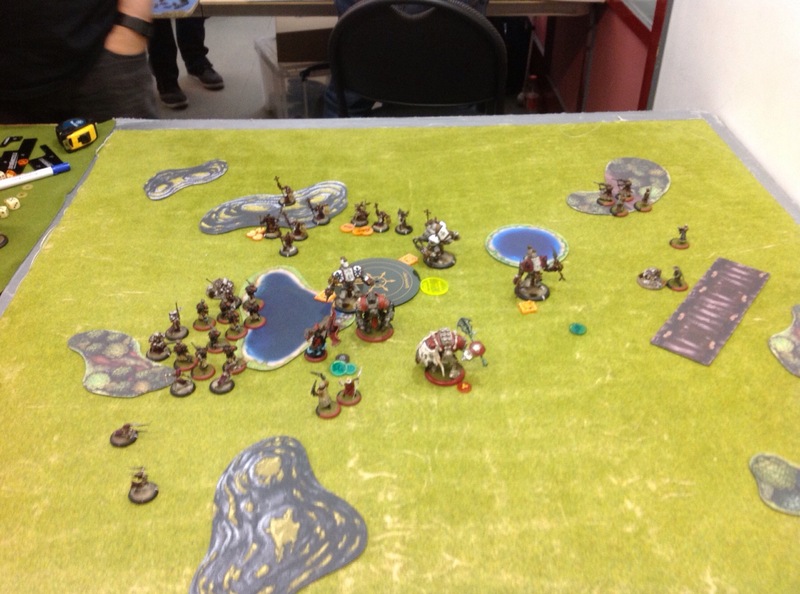 The Vassal of Menoth and Mechanik follow the Jacks. The TFG are stuck in the middle. 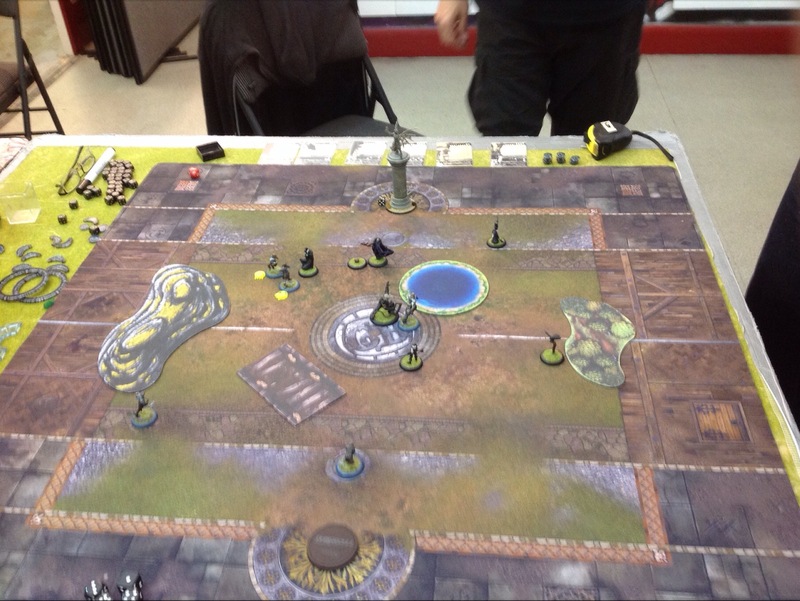 All in all, it’s a bad day to be a Flameguard as the unit is almost entirely wiped out, taking a Cannoneer shot, and some arced Ashes to Ashes spells, fuelled by a feating Hexxy, cunningly targeted at Choir members and Rhupert Carvolo to avoid the TFGs Arcane Ward. The Iron Kingdom’s weep as Ord’s Pipes are forever silenced. A Hymn of Battle enhanced Combust by the Castigator and an arced Ashes to Ashes from Sevvy through the Blessing of Vengeance sees off all but one of the evil bastards on the right. 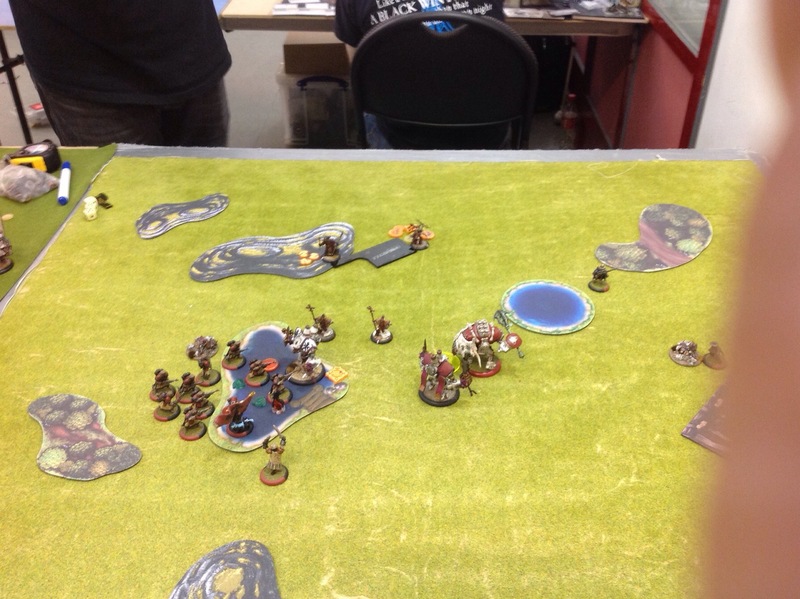 Sevvy’s Fires of Communion feat finishes off the leader and puts a dent in the Nihilators. It also lays down two 4” zones of continuous fire which should keep the Nihilators at arm’s length for another turn at least, he also puts Arcane Ward on the centre Vanquisher. 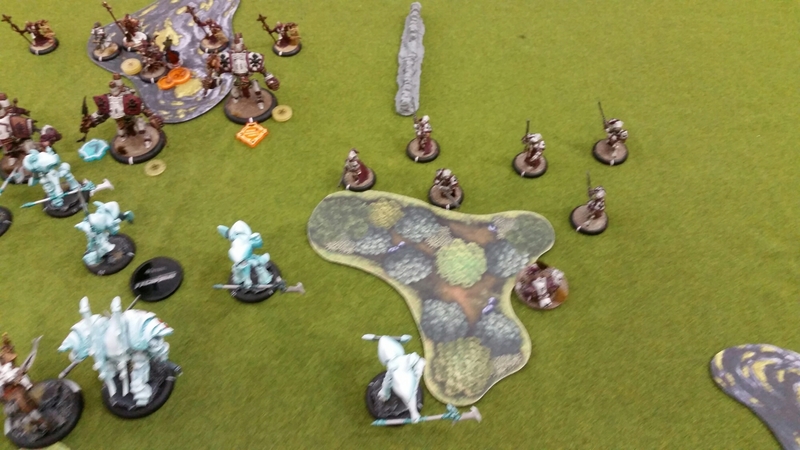 Said Vanquisher strolls forward and, thanks to Sevvy’s Awareness Spell, takes a pot shot at the Skorne caster. His Cyclops bodyguard dives in front and takes the fireball which ignites it, the Gladiator Titan and the dreaded Baby Elephant of Doom(tm). Shame, I love that little guy… NOT! A quick Flesh Hardening from the Will breaker and the little guy is free of flames (Boo!) He wanders closer to the front lines, wailing in pain and sapping the strength from the array of Menite Jacks. 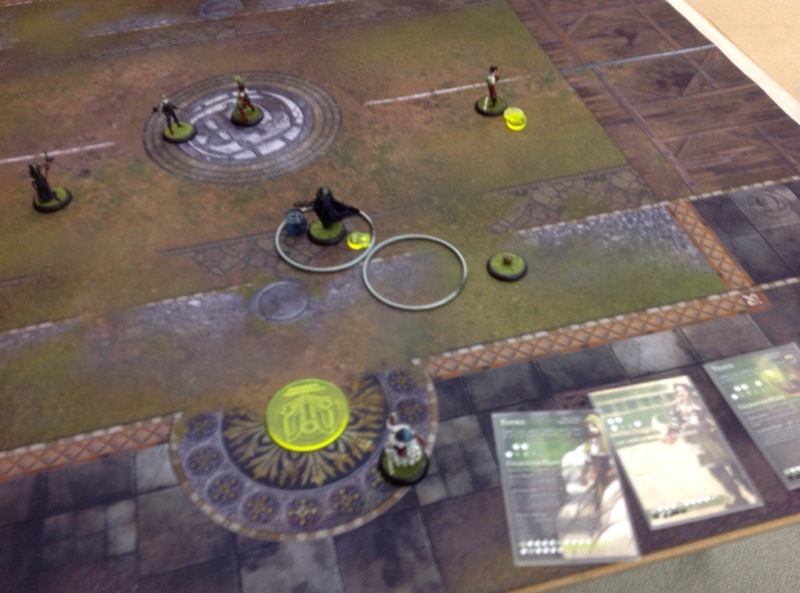 The Titan Gladiator charges the exposed Vanquisher but a combination of the Arcane Ward and some terrible dice throws means that the hulking brute only manages to land two blows (from 6!). One is shrugged off by the Jack’s Oracular Ability and the other merely scuffs the paint. 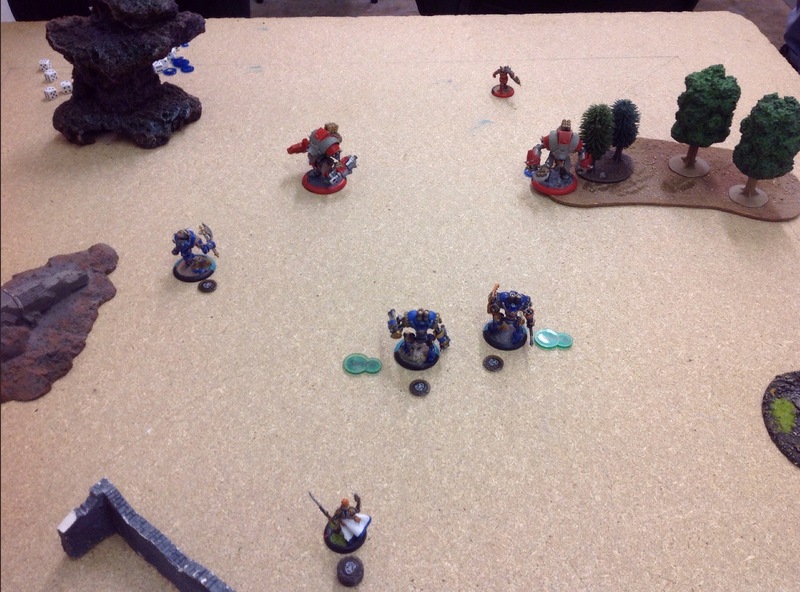 On the left flank, the Reckoner gets charged in the rear by the Nihilators and they destroy his movement systems. The Drake decides it’s time for a bath and heads into the lake to spray the crippled Reckoner whilst in the centre, a combination of the Cannoneer and the Worm-thing destroy the Menite objective. 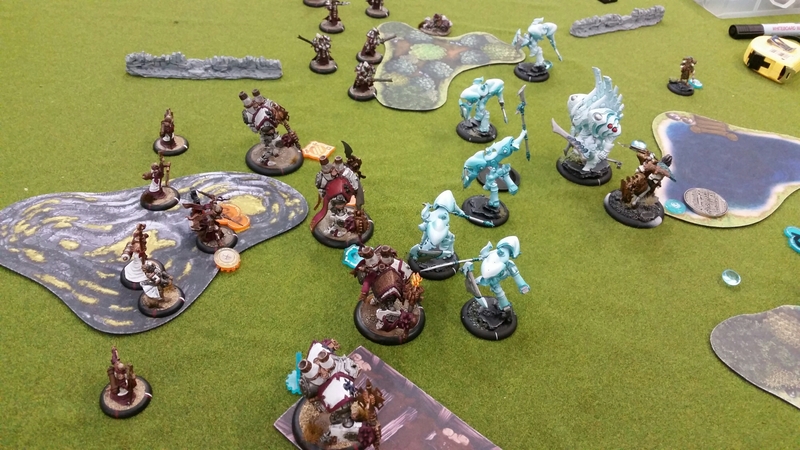 The Feral Geist moves round to threaten my support troops and Caster. 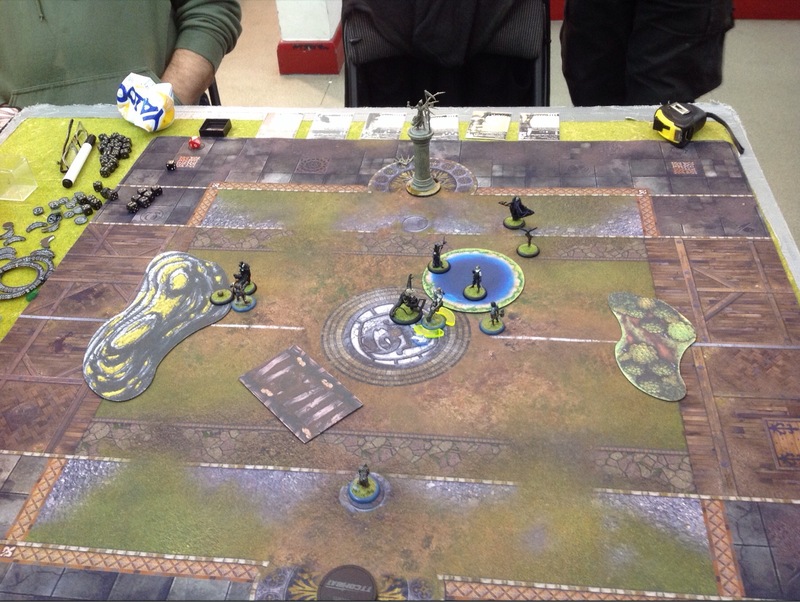 Sevvy Hex Blasts the Feral Geist while the Gladiator pays the price as the Vanquisher, strength restored by Hymn of Battle, the Castigator and Blessing of Vengeance all team up on him. The other Vanquisher shuffles up behind the Nihilators attacking the Reckoner and Threshes the lot of them allowing the Reckoner to advance (very slowly) into melee range of the Drake and proceed to smack it about a bit. All this action means that Sevvy has no focus left to camp, something that almost cost me the game! The Cyclops runs forward to jam the advancing Menite Jacks, whilst the BEoD™ hides behind it and continues to wail. Unexpectedly, and seeing Sevvy without the focus to use his Oracular Ability, the Titan Cannoneer tries his luck and launches a cannonball at Sevvy, hits and almost succeeds in taking the old man’s head clean off! Hexxy then looks to finish the job with an arced Hellfire spell through the worm-thing which narrowly misses, singing the old fellas grey hair and almost requiring me to change my trousers! Panicked, the Menites tie down as much as possible in melee to stop another attempt. The one remaining TFG and a Choir member are all that can be mustered to engage the Worm-thing to stop it arcing spells, whilst Blessing of Vengeance gets carried away and charges the caster and the Titan Cannoneer, a choice it would later come to regret. In the centre, the Vanquisher threshes the BEoD and the Cyclops while Castigator attempts to throw the now almost dead Cyclops at the Cannoneer but old one eye proves too slippery to catch. On the left flank, the Vanquisher, humming contentedly to itself, continues to protect the flag, all the while chewing its way through the Nihilators. 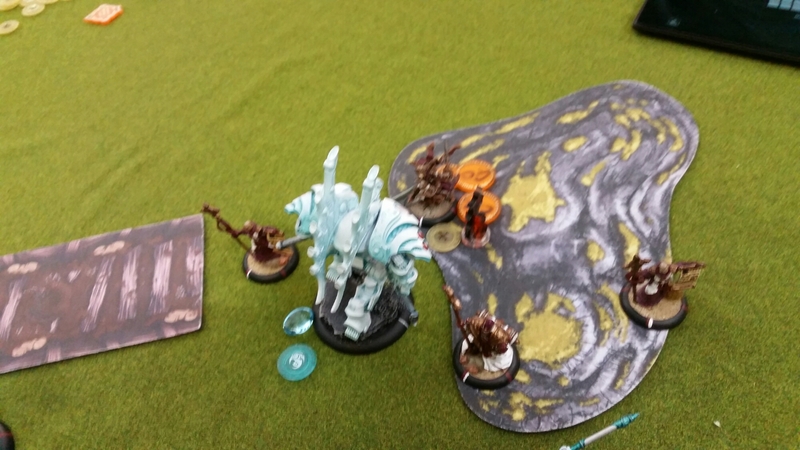 The Heirarch receives medical aid from the Heirophant and camps a few points of focus just in case. If at first you don’t succeed, try, try again, so the Castigator has another go at throwing the Cyclops and this time succeeds in launching the unfortunate Warbeast into the Cannoneer, killing it. Unfortunately for me, I’d forgotten that it wouldn’t knock down the Titan as its base was smaller. Oh well, you live and learn. Time is definitely running out for Hexxy though as the remaining Menite Jacks take the opportunity and close in, picking off the remains of his army as they go. The Mechanik scurries across to the Reckoner, dodging enemy whips, and fixes the Reckoner’s movement systems while the Jack takes it’s frustrations out on the Cannoneer, slaughtering it. The Castigator walks up to Hexxy and Combusts again, killing the Willbreaker and doing some minor damage to the Warlock. Hexxy throws all his night at the Castigator but doesn’t make much of a dent. Every last Skorne is destroyed before, empowered by the Vassal and bolstered by the last remaining Choir member, the Castigator finishes the job! I know he feels he made a few mistakes, both with Hexxy’s feat (not running the beats hot to leave some Fury for the following turn) and with the Worm-thing, forgetting to “Drag Down” a choir member towards the end of the game to get disengaged and able to channel spells at Sevvy. If he’d not, the result could have been very different. I started to feel like I was winning right about the moment the Cannoneer shot Sevvy. I didn’t think it would come off. Sevvy was DEF18 (DEF14 plus Cover) and the Cannoneer is only RAT4 (I think) so Adrian needed to roll a 14 to hit. I feared the worst when he rolled 15 and the thought of a boosted POW15 damage roll was enough to have me sweating buckets! At 3 dice +1 a good roll could have killed Sevvy right there and then, and it almost did, leaving the Heirarch on just 4 hits! I was so lucky the follow up Hell Fire spell from Hexxy missed, otherwise Sevvy would have been toast. Personally, I like this list. It’s good at taking down infantry and it can handle all but the heaviest armour. I made a couple of mistakes, particularly putting models near the Arcane Warded TFG, which enabled Adrian to target other units and still hit them and forgetting to camp focus on my Jack’s and caster to avoid things like random cannonballs to the head! 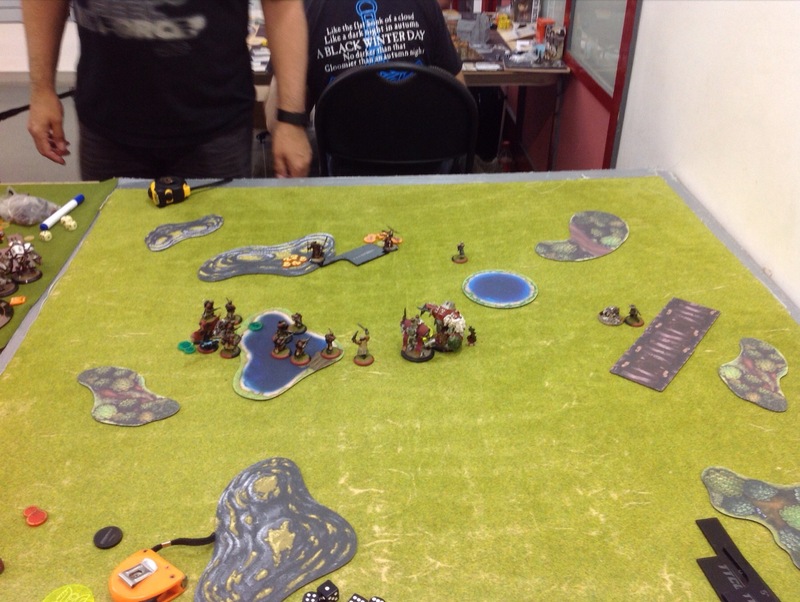 We are running a small league here, and for my first game I have drawn our local Protectorate of Menoth player Jason. Scenario is Incoming from the core rule book. 3 Flags, 1 point for each controlled on your turn. First to 5 wins. 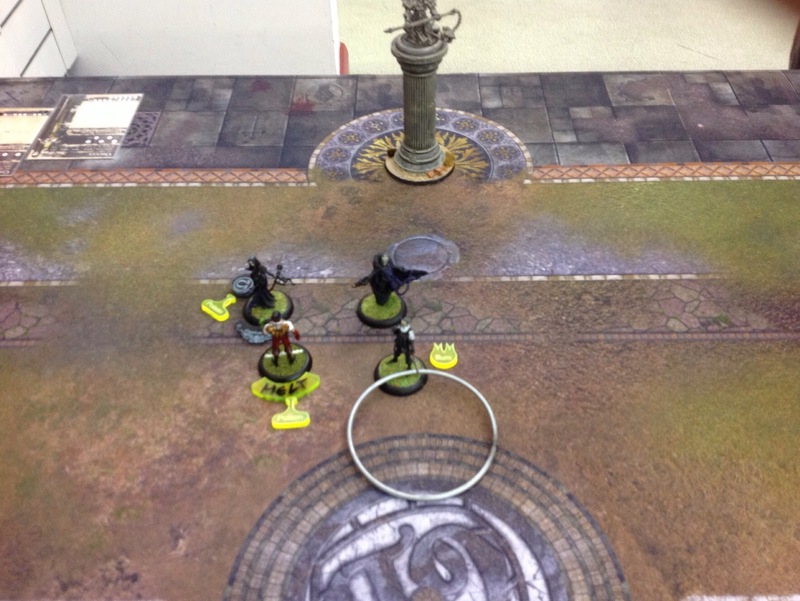 Protectorate Turn 1 Thyra casts Gates of Death on herself and Occultation on the Knights Exemplar. The Choir puts the Hymn of passage on the jacks and everything else advances. Khador Turn 2 The Faction sniper division begins a long run up the flank, as their non magical guns are not much cop right now. 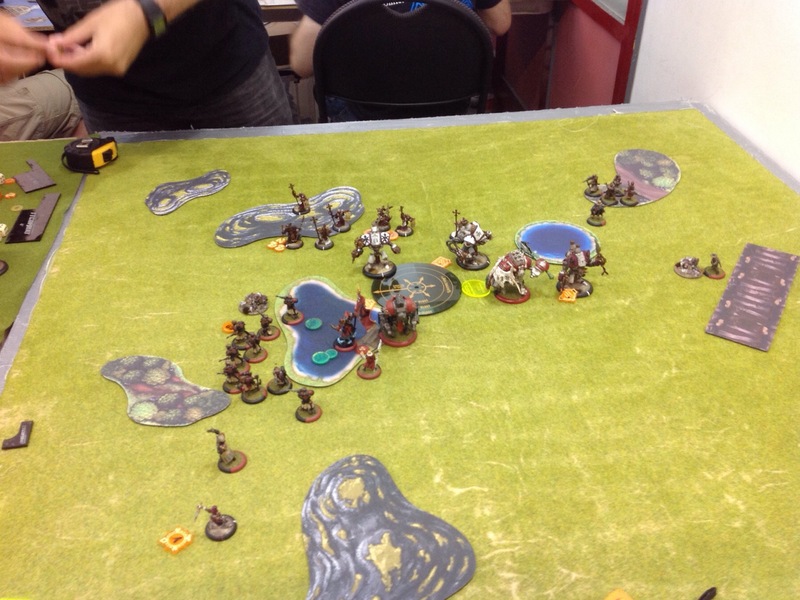 Kell advances into the trench and plinks off 3 damage boxes from Blood of Martyrs with Silence. The main Khadoran forces advance cautiously, being careful to remain outside the enemies threat ranges. 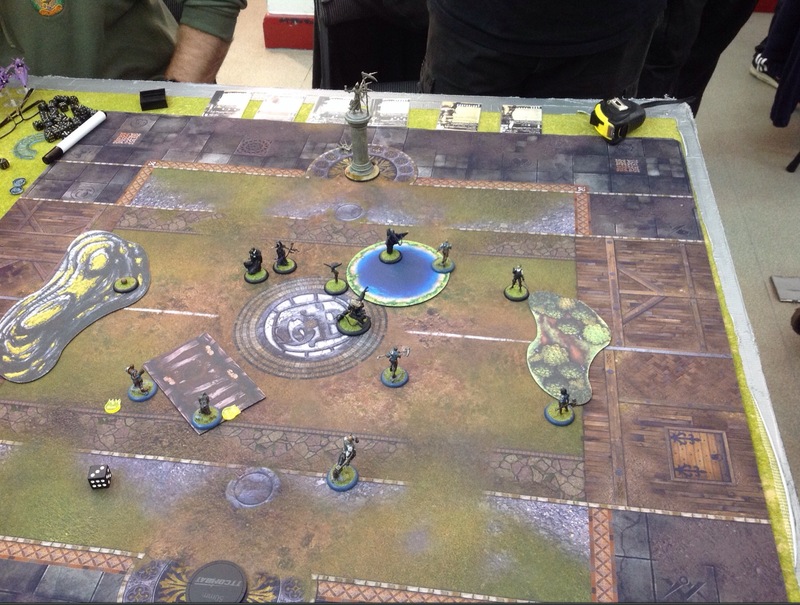 Kovnik Joe does nothing, as the Rifle Corp are already Tough while Stealth and Hymn of Passage makes them redundant this turn. Sylys whispers some Arcane Secrets to Irusk, who then advances. he pops a single Daughter of the Flame with Airburst, casts Solid Ground and throws down an Artiface of Deviation in the exact spot to cause the biggest headache to the enemy. Protectorate Turn 2 Thyra upkeeps her spells. The Daughters run to the extreme flank. The Knights advance as far as they can while the Jacks all advance to offer the cheap Crusaders as trades, with the Castogator and Blood of Martyrs ready to respond. The Choir continues to sing Passage, and the rest of the army shuffles about a bit for better positioning. The Vassel repairs the damage Kell had done to BoM. 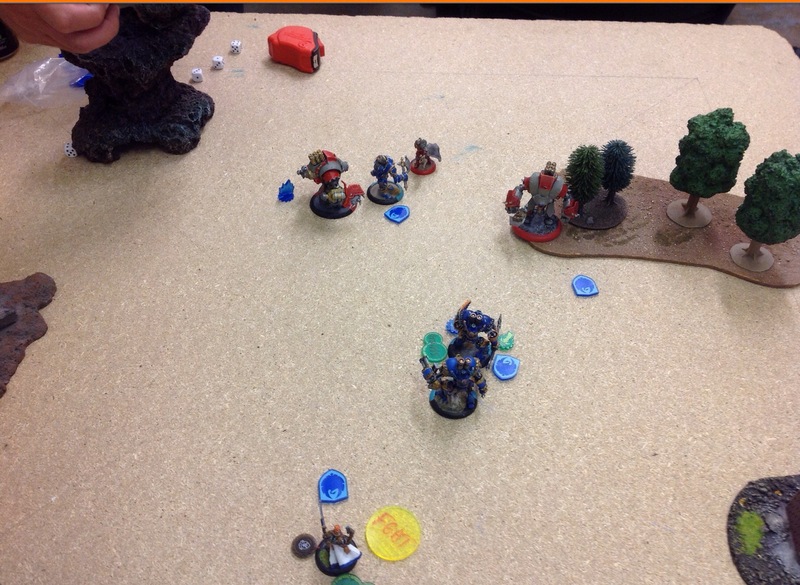 Khador Turn 2 Irusk Upkeeps Solid Ground for free, and drops Artiface of Deviation. 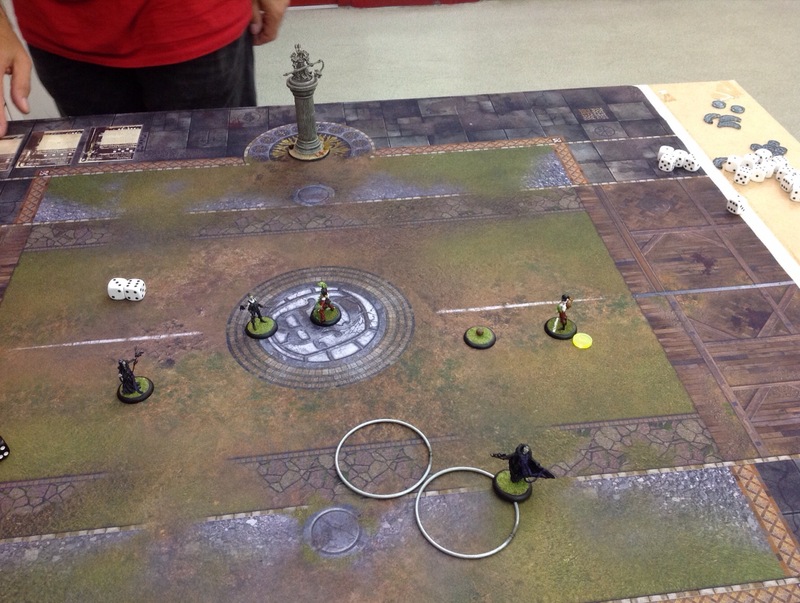 The Widowmakers run, while the Marksman advances and drops a Choir member. Kel moves up to claim the Flag, and takes out a second one as BoM has moved out of range. 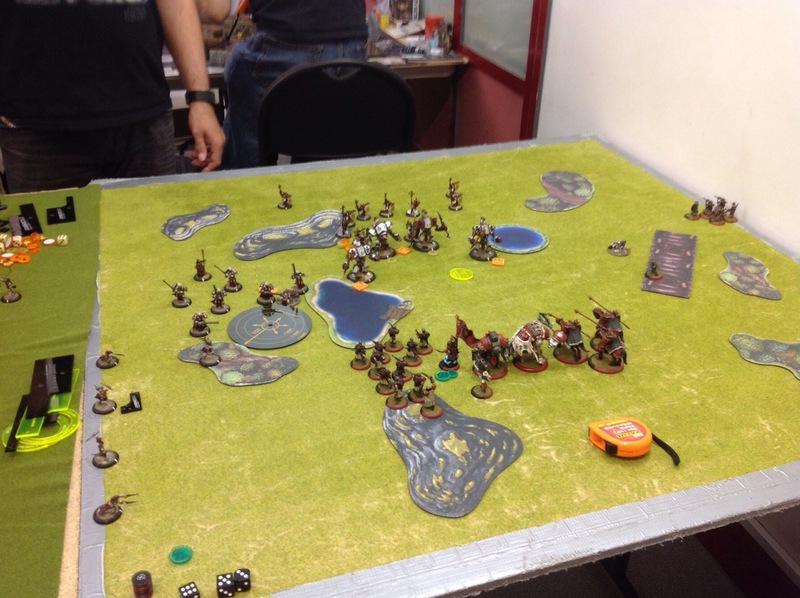 Irusk puts Battle Lust into the Uhlans and pops the AoD template into a new spot. He then Advances and Feats. Joe gives the Rifle Corps Boosted Attacks, and they then advance to within range of the Knights to see through their Stealth. They take out a couple of Knights and a Daughter, who had been left suspiciously close. The Uhlans charge a Crusader and utterly destroy it. The Jacks saunter about, but not too close to the enemy. Kell scores a point. Protectorate Turn 3 Thyra Upkeeps her spells, and Allocates some Focus. The Daughters Vengeance forward, then run to engage. The Knights Exemplar attack the Rifle a corps but only take 1 out due to the magic of Tough and no Knockdown from Solid Ground. The Choir sing the Song of Battle as the Jacks prepare to get into the action. 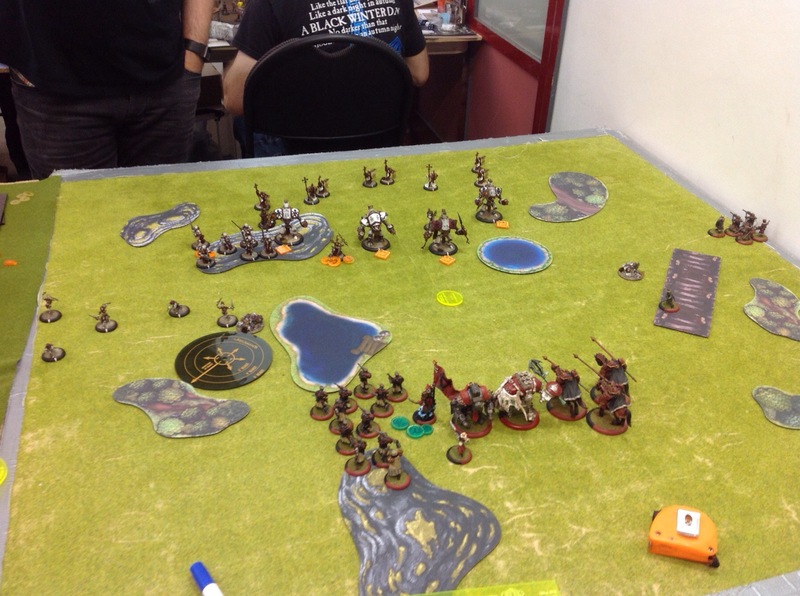 First Thyra moves forward, Feats and casts Carnage. The Crusader manages to charge the Marauder and takes out its Cortex. Thanks to Feat, his Bond and Sidestep, BoM is able to take out all the Uhlans. 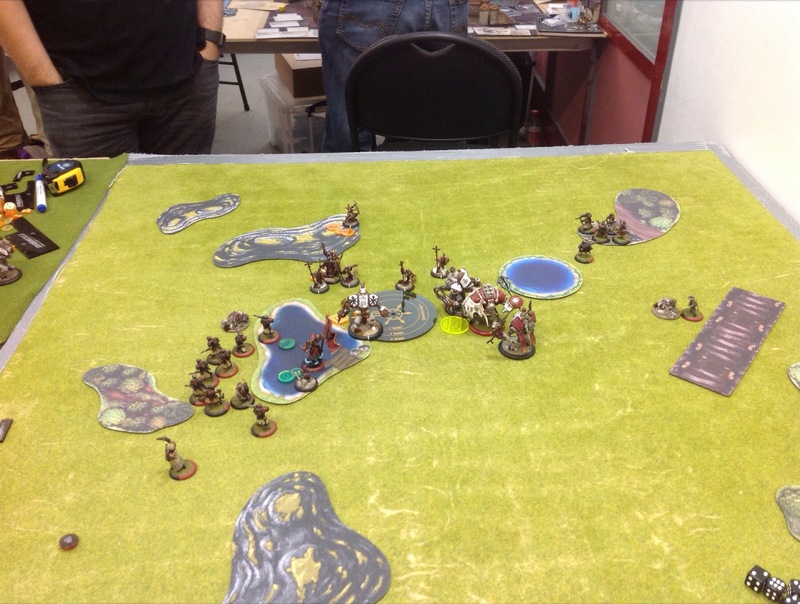 Khador Turn 3 Irusk Upkeeps and dishes out some Focus to Ruin. 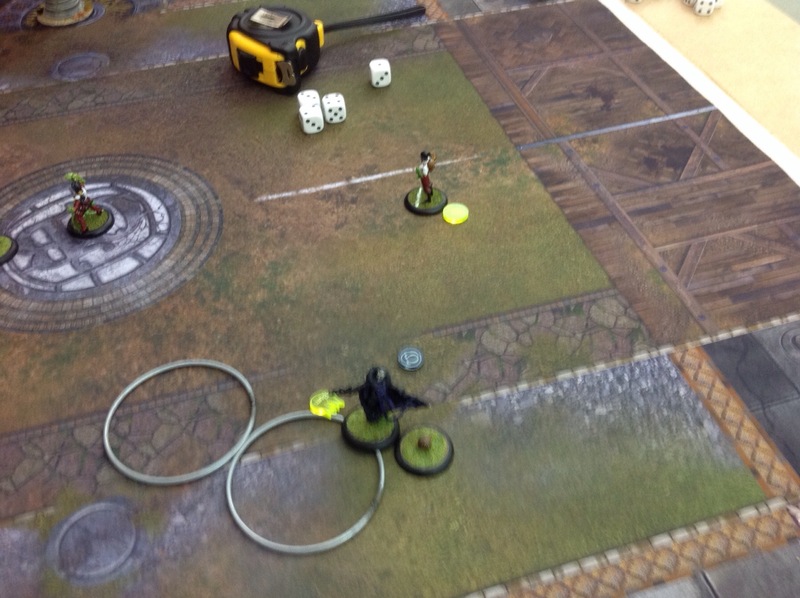 Kell, the Marksman and 3 Widowmakers put 12 damage onto BoM, sniping out his Cortex. The final Widowmakerputs a round in the skull of the Mechanic, stopping any Repair nonsense. 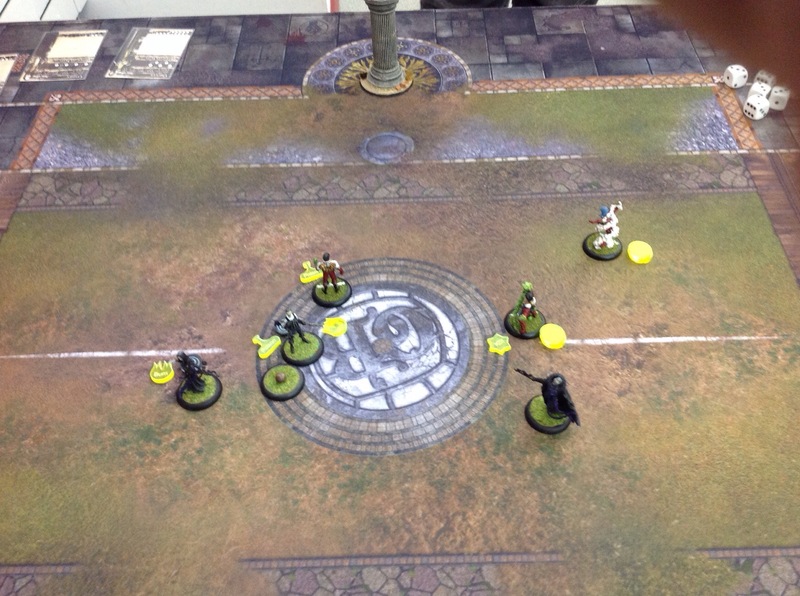 Ruin charges the Castigator, believing BoM to be no threat now without a Cortex. He does plenty of damage, but fails to kill it. The Marauder walks up and Slams the Crusader away with a ComboSmite. 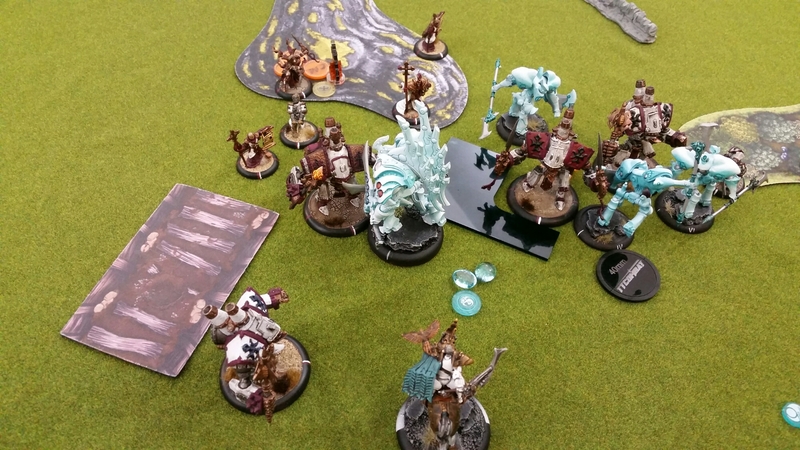 Realising that the Daughters have Acrobatics and Parry, Joe hands out Boosted Attack rolls and charges one, taking her out. Irusk puts Battle Lust onto the Rifle Corps and moves up, taking out a Choir with his gun. The Rifle Corps then go to town, taking out all the Knights and leaving a single Daughter alive with 3 dice to hit and damage. 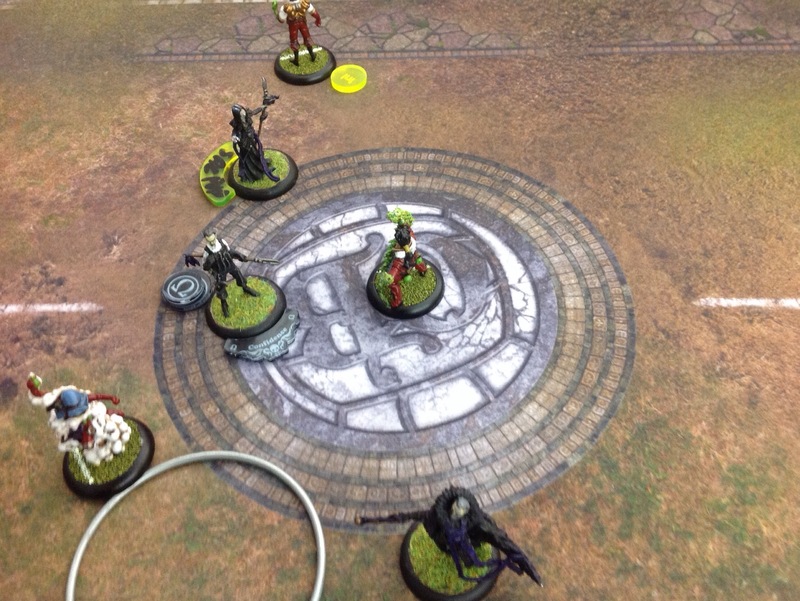 Sylys hangs out in the rear, while Kell scores another point. Protectorate Turn 4 With troops getting scarce on the field, the Protectorate does what it can. Thyra Upkeeps GoD. The Choir Sing Battle and the Castigator and Crusader go to work. The Marauder is wrecked, while Ruin takes some serious damage, losing his Cortex and Mace. The remaining Daughter charges Irusk, but he negates all the damage with his focus. With her second attack she reaches out and touches Sylys, ending his mercenary career. Khador Turn 4 Irusk drops all his Upkeeps. The Widowmakers advance and continue to snipe out a choir and boxes off Jacks. The 2 Solos Aim and shoot into combat, taking out more boxes on BoM. Ruin wrecks the Castigator. Irusk retreats a bit, then takes out the Daughter with his sword. 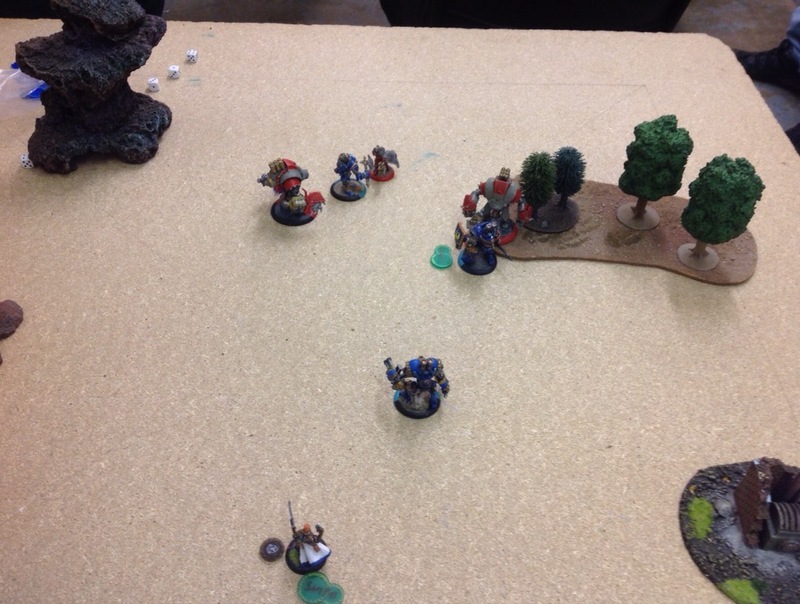 He then puts Fire for Effect onto a rifleman and camps what is left of his Focus. The Rifle Corps advance up and put one massive fully Boosted CRA into the Crusader. The damage roll is poor however. 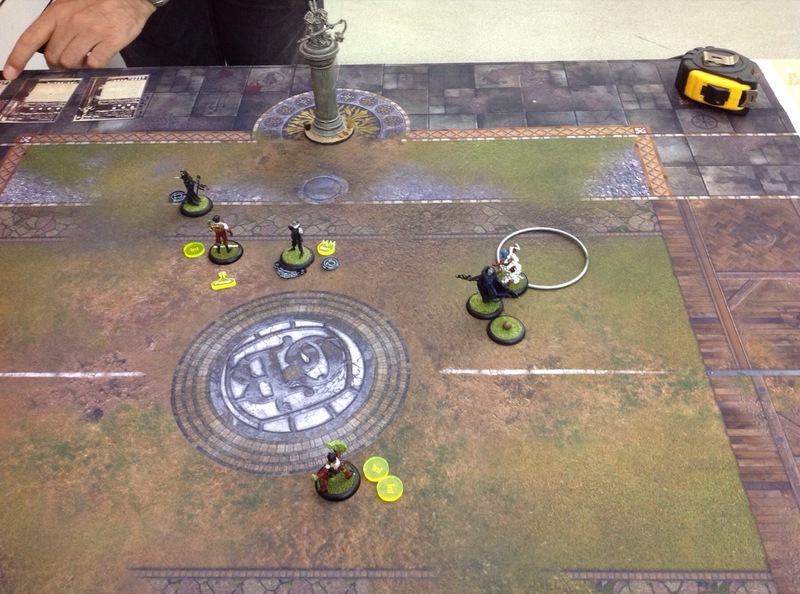 Joe hangs out and Kell scores another point. Protectorate Turn 5 Thyra decides to get involved and charges the Widowmakers, using Overtake and Carnage to mow them all down. GoD safely moves her back at the end of the turn. BoM try’s his best to take out Ruin, but with no Cortex does very little. Passage is sung by the remainder of the Choir, and the Crusader takes out 2 Rifle Corps, but Irusk inspires them with his patriotic flag waving and they decide just to fall down after passing their Tough rolls. Khador Turn 5 Irusk puts out Solid Ground and Battle Lusts the RifleCorps, but is unable to reach the Flag due to Rough Terrain. Joe inspires the Rifle Corps with his stories of drunkenly wrestling bears and gives them +4 Strength. 3 of the infantry are able to charge the Crusader and rip it to pieces. The rest run to claim the Flag. Ruin is able to tickle BoM a bit, and Kell does some more damage. The Marskman takes a shot at the Reclaimer but misses. 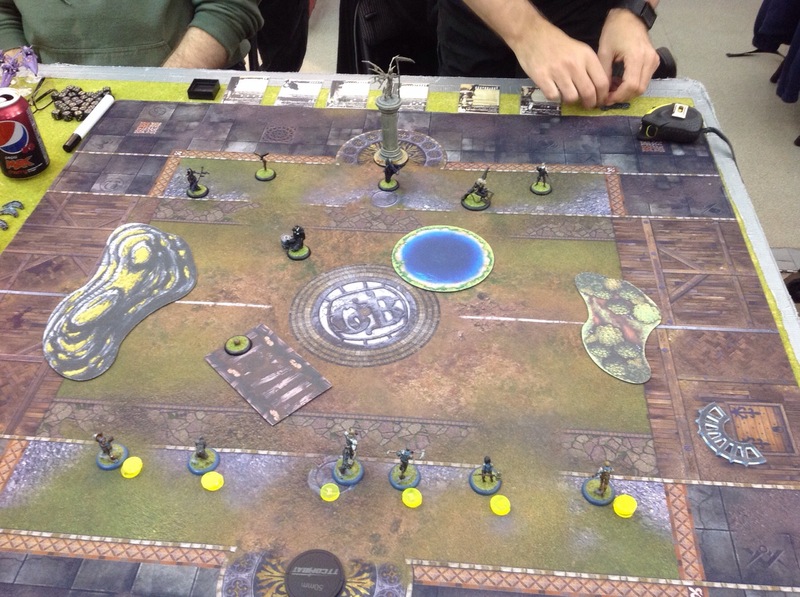 2 points are scored for a Khador victory. 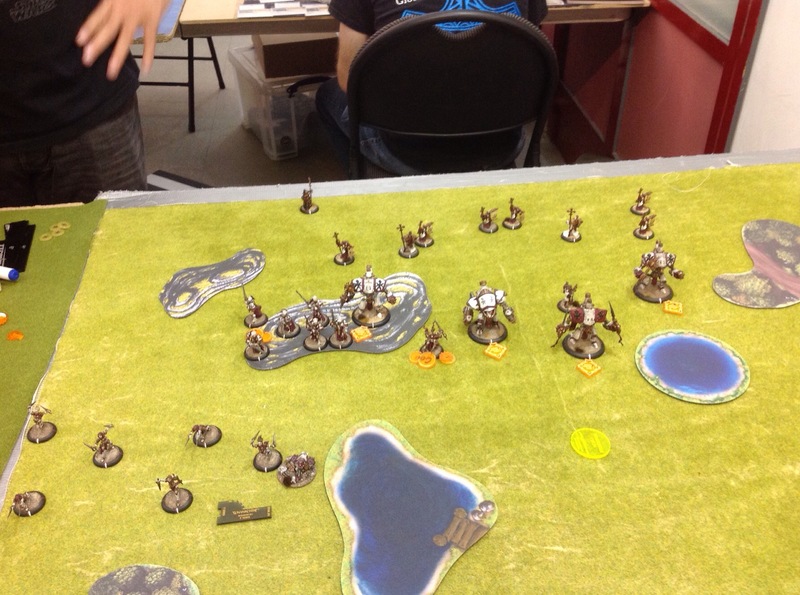 That was an enjoyable game, but by turn 3 we both realised just how badly the terrain was hindering the Menoth side. Coupled with Irusks spell list and feat, the holy zealots had a serious uphill struggle. I also had some great dice, only failing 1 out of 6 tough rolls and the Uhlans utterly destroying a jack in one charge! Hopefully though it’s given Jason some good practice for his tournament on Saturday, and I will definitely be using Irusk again. I played Vyross 2 a lot in MK2, at times he felt like Retribution’s only decent drop into the majority of builds out there especially if you wanted to be a bit competitive. Retribution had some nice tricks in MK2 but until towards the end of MK2 when the Aussies really started to come to the fore with certain builds ( Kaelyssa’s Force wall, Ravyn and the Will of the nine voice’s and of course Vyross 2 and the Murder of Griffons ) and American players like Vicarious Competition who’s main builds lent towards (in my opinion) Issyria and Ossyan ( poor Ossyan, such potential in MK2, he was meant to be our saviour but his rules just didn’t quite match the fluff, but was reborn a monster in 3 though !) and if you have followed Retribution in the major tournaments I discount Will Pagani winning “that” tournament as he only did it to prove a point. “Back on track”, until towards the end of 2 no one felt that Ret was a major tournament force. Certain builds mentioned above made Ret more competitive and with Vyross 2 I always felt that I had a chance in any game I played, good players could alway’s see flaw in the build ( deny the synergy chain ) but if I could get it rolling I could often get a chain of +5 to +7 with concentrated power on Imperatus ( ps 26 ) sidestepping into a caster/lock and murder them. Mk3 arrives and Retribution comes out pretty good in the shakeup, synergy gets a nerf limiting it to +3/+3 and the general buffs to other Ret units and casters, suddenly Griffon spam is no longer the favoured son !, good for denying Cygnar electrical shenanigans but defiantly put on the shelf somewhat in favour of newer toys. It was as I said earlier one of my favourite builds and I have been wanting to try it out in 3 to see if it stands up in 3. So I present to you the Big V’s first outing in 3. 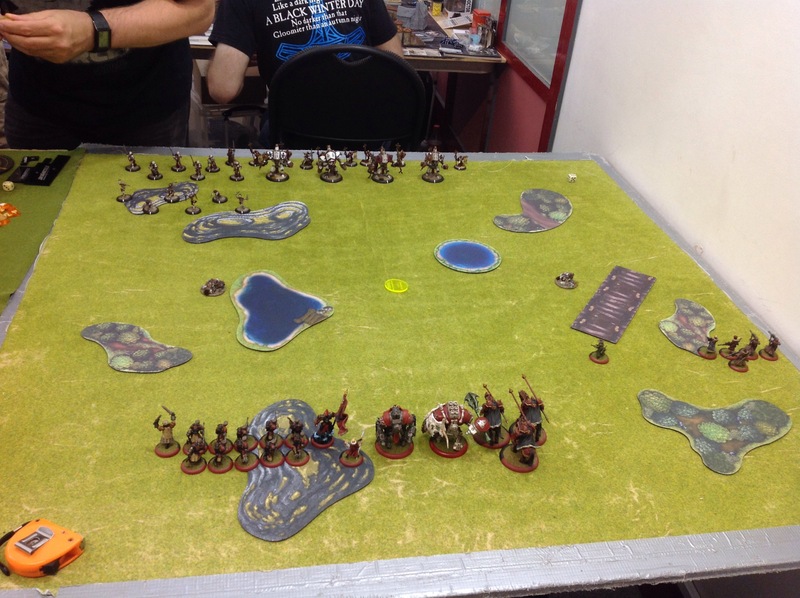 Jason wins roll and picks side, I go firSt and set up my battleground centrally, I put HRT and E2 on my left to threaten and disrupt any jack that tries for the flag on the left. Jason puts the daughters across from the HRT and E2 and I know I have already lost that flank. Knights have been positioned with a forest in between them and me, his positioning is not good as they have no way to get pathfinder but I will not be able hold that flank either once they negotiate the forest, I remind myself not to poke them with long sticks as they get really good then !! Jason’s Battle group moves up for positioning, choir does what choir does, buff buff buff. Mechanik moves up onto hill behind Jacks, wrench and hammer in hand. Thyra casts a spell or two ? and moves up on to hill behind mechanic. I am already planning assassination not because of any tactical acumen but because I know I will lose the attrition and scenario war, I upkeep synergy and move the 2 Griffons on my right to contest and screen the rest of my force from the knights ( the forest will come into effect know, Jason will not be able to charge me and I won’t kill any of his Exemplars as that will give them pathfinder and I have no desire to be on th end of charing weaponmasters !! On the left I know I will lose the HRT but also want Jason to not ignore it and use his daughters as jamming piece’s so I take a shot at fire of salvation and really emphasis the armour piercing goodness of the wpn, damage is dice -2, I don’t do huge damage but enough for Jason to consider it a threat so he devotes his daughters to killing it effectively taking it out of the assassination. 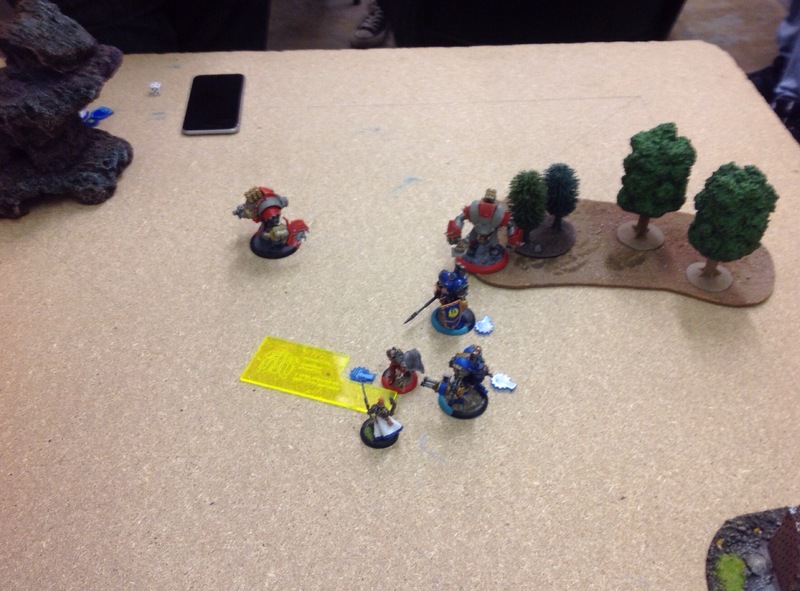 Eiyrss shoots a crusader and disrupts it ( in the after game talk through, we came to the decision that it was the wrong target and that I should have directed fire of salvation but looking back at it now it stopped a choir buffed crusader charging a Griffon and most likely scrapping it ?? ), E2 then repositioned to the other side of the forest to negate any vengeance against her. Vyross goes next moves up fires a stranglehold onto blood of martyrs to stop any charging or trampling nonsence then shoots a couple of ineffective shots then repositions back a bit. Imperatus goes next, I did happen to notice that Thyra had got a bit close to the mechanik last turn so I take a pot shot at the mechanik killing him which procs flame burst and sets Thyra on fire…… Oh the irony !! It is right about now that I remember that I did not allocate focus so my Griffons which were meant to take out fire of salvation are going to have a bit of a hard time ! I fire them in and they do a bit of damage but leave the jack standing…sad face. Over too Jason, because I killed his mechanik within 5″ of his blood of martyrs it know gets +2 to damage rolls, oops, still it was worth it. Daughters slaughter the HRT, quell supreme ! Exemplars run to engage but mostly get caught up in the forest. Bit vague on the order of activation for the rest of the turn ?, it did involve Thyra moving up casting stuff Inc a spell that let her teleport 6″ at end of her turn. Thyra then finishes it off leaving fire of salvation free to scoot over and take out his issues on another Griffon which clings to life on 1 box ( cortex) his other jacks attack but fail to kill the 3rd Griffon, Thyra teleports to hill. Assassination run is now or I will lose, sorry for Jason for taking about 15 minutes to set it up. I upkeep synergy duh !, allocate all my focus out except 1, imperat us gets 3 in total and concentrated power. 3 Griffons go, move out of impy’s charge lane and set up a +3 synergy chain, V2 goes moves up field to ensure Impy stays in the 12″ synergy bubble and shoots a choir member, Imperatus then goes, charges the crusader on my left for free cos of his bond with V at ps 22 cleaves him with first initial, sidesteps in a choir member cleaves him and sidesteps into Tyra, buys and boosts leaving her on a couple then buys and boosts another hit killing her. Nice little game, Jason did a lot better than I think he thinks he did. 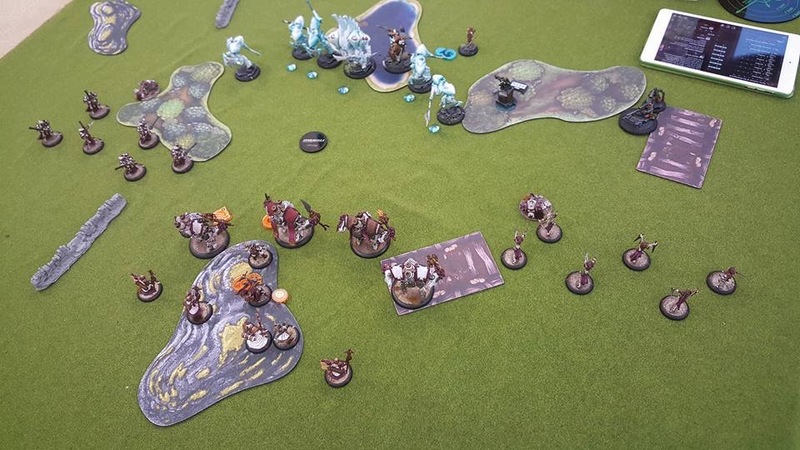 He played an assassination caster but was doing very well on the attrition/scenario side and would have won if he had protected his caster better. Also when playing that sort of caster you Need to think assassination from turn 1, I don’t think it had crossed Jason’s mind !. Also has to be said that he had not faced V before so it’s always difficult when facing a new caster. Not the most original title but it’s been a long day! 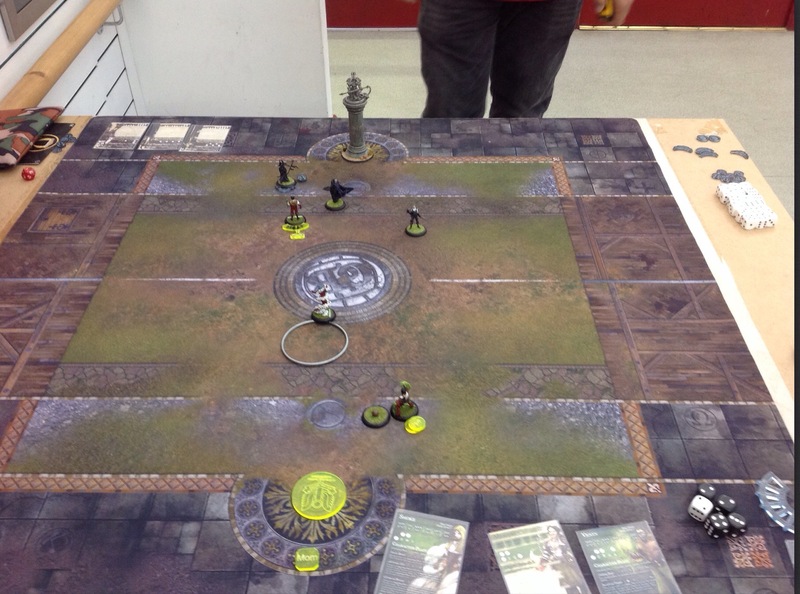 I’ve recently gotten into Guild Ball with an Alchemists and Masons team, and a couple of weeks ago took on Jason’s Morticians Guild in a 3 aside match. This was a long game (and also a lesson in taking good notes) but here are the highlights! 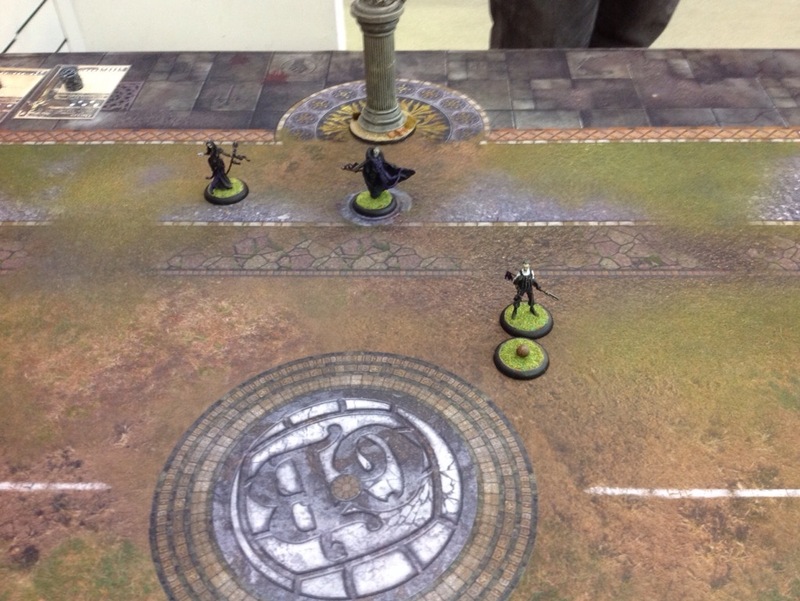 The Spooks win the roll and chose to kick off. Obulous, Graves and Cossett are on the field. Smoke, Venin and Mercury form the Lab Rats dream team. 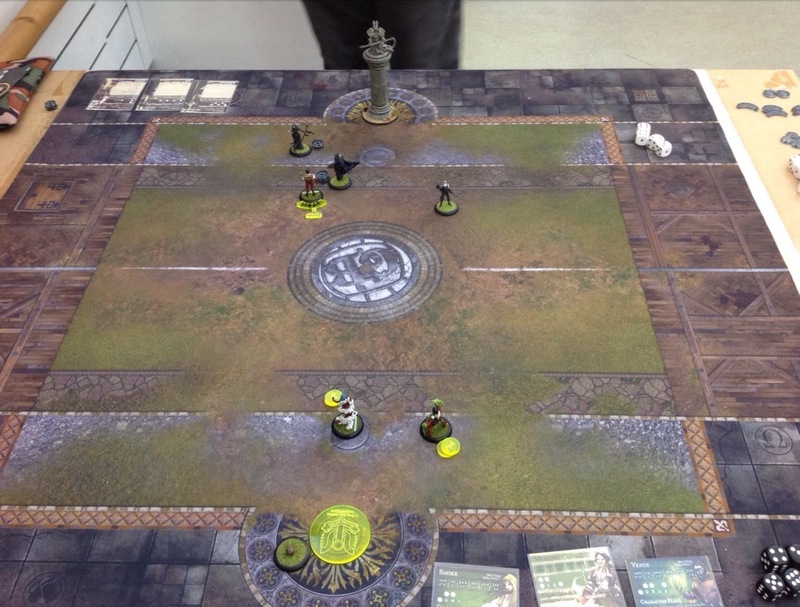 Venin runs up and kicks the ball back to Smoke… and misses. The ball lands behind the goal. He puts up melting body for the extra armour. Obulous advances, puppet masters Venin forward and proceeds to knock him about a bit. He also puts confidence on Cossett. Smoke runs to grab the ball, then cloud jumps forward before passing it to Mercury to start the momentum game. Graves has a pop at Venin before getting a fireball to the face. 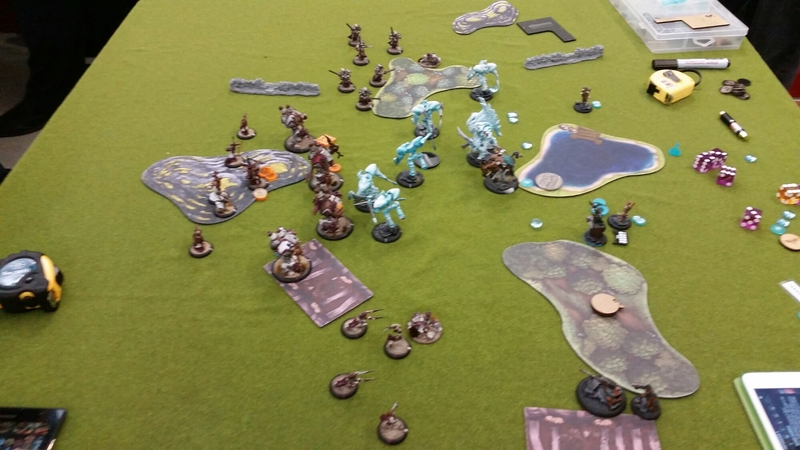 Then Cossett goes full screaming banshee mode and charges Venin with a 13 dice attack! After the dust settles she has generated 3 momentum and dodged away. Venin is a bloodied mess, although he left Cossett poisoned. 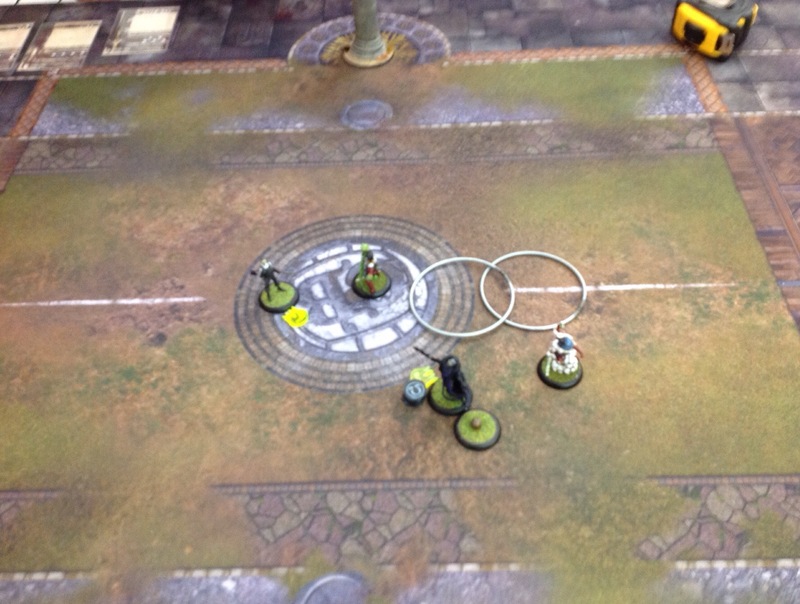 Obulous convinces Mercury to give him the ball, then Smoke charges in to try to get in back. She forgets about his unpredictable movement, but throws out a cloud and jumps back into range. She spectacularly fails to get the ball off him though. A couple of activations later and this is the board state. 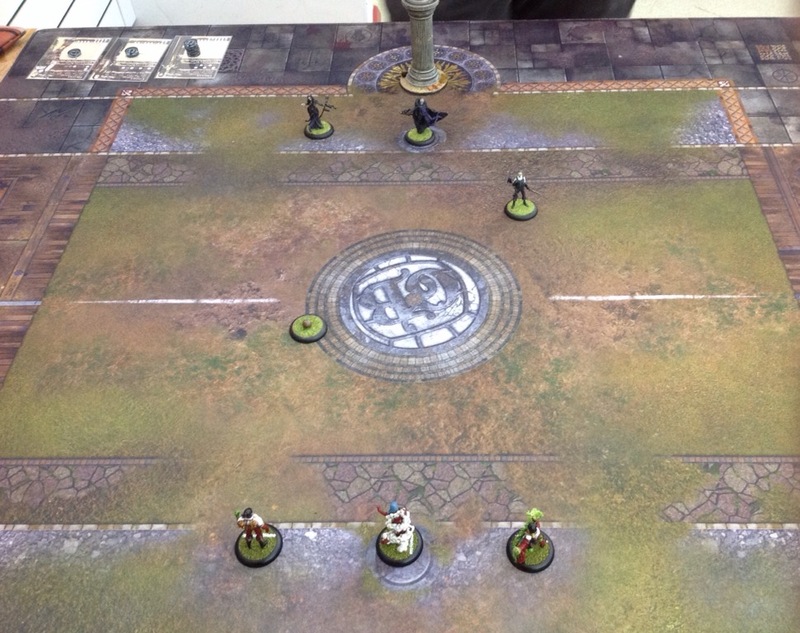 Players have moved around and Graves has the ball. Conditions are everywhere! Cossett and Venin are looking very unhappy due to the damage they have taken. Smoke advances and jumps, fails to tackle again(!) then pops her legendary play. Cossett is taken out and the other Spooks take damage. 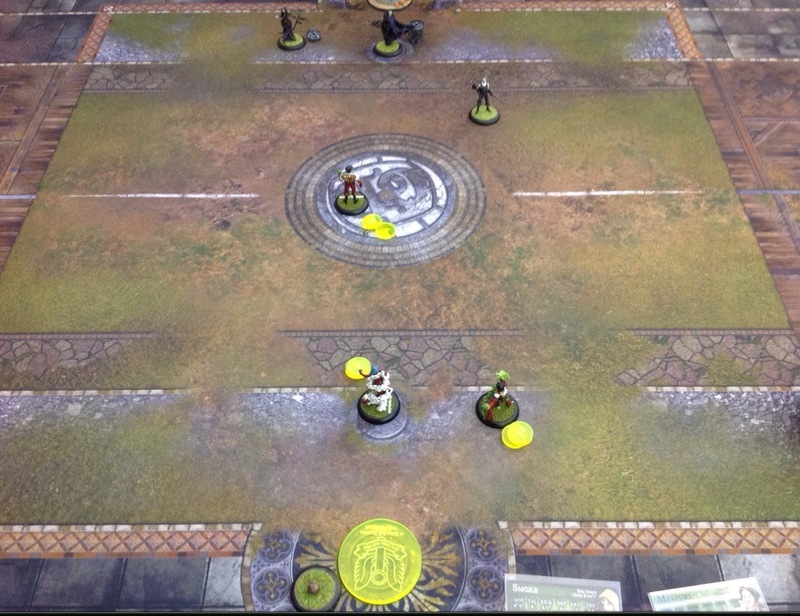 Some more activations later, and Smoke messes up big time while trying to walk away from Obulous, he grabs the ball. He activates next, shadow likes to max melee range then proceeds to hit her for momentum. Last attack dodges away, into range of goal. He shoots…and misses! The next round, and Smoke retrieves the ball, only for the scatter to be bad and put it in range of Obulous! 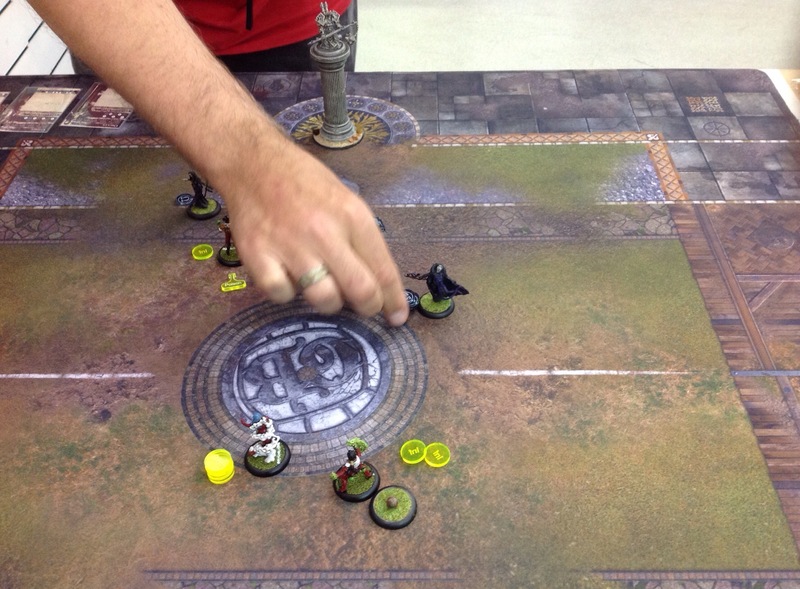 Obulous grabs the ball and scores! The kick back into play is not bad, putting it near Venin, who had previously been taken out. He grabs it and runs, planning to score next turn. 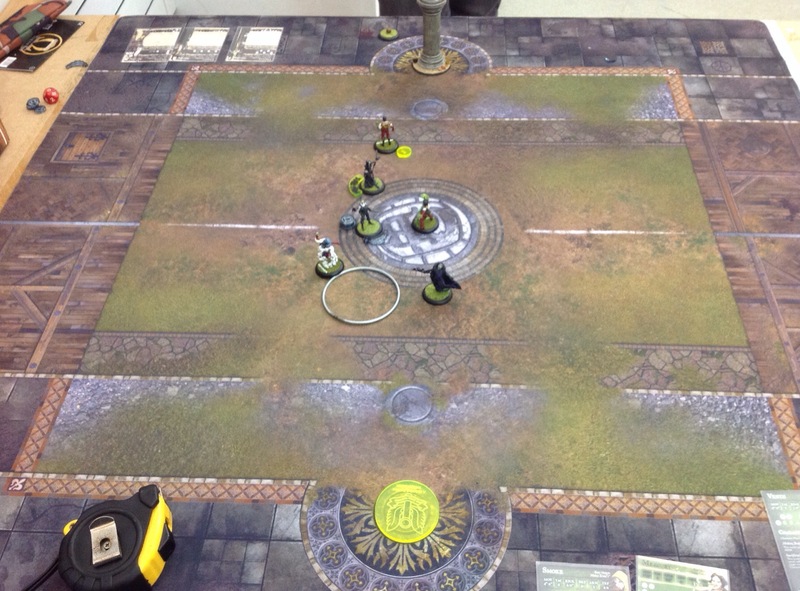 Next turn comes and with the Alchemists winning initiative Venin charges Cossett to generate momentum. Getting in range of goal he shoots and misses as well! W!T!F?? Smoke run and jumps to get back in the game. Graves puts the boot in on Mercury. A lot to learn in this game. The most important stuff was regarding how not to do a match report! We were rushed for time, I took loads of pictures then really, really bad notes. To cap it off I have waited 2 weeks before getting time to write it up, leading to less than perfect results! About the game itself; I rarely felt in control. I was able to put out loads of conditions with Smoke, but was starved for momentum. This meant I was unable to clear things like Bleed off Venin, or to stand Mercury back up. Obulous himself is also a monster. That Confidence ability is fantastic, and turned Graves into a combat monster. I’ll definitely be ready for him next time, and reckon Midas may have to make a showing (although I do love Smoke). I’ll also consider how best to record these games. 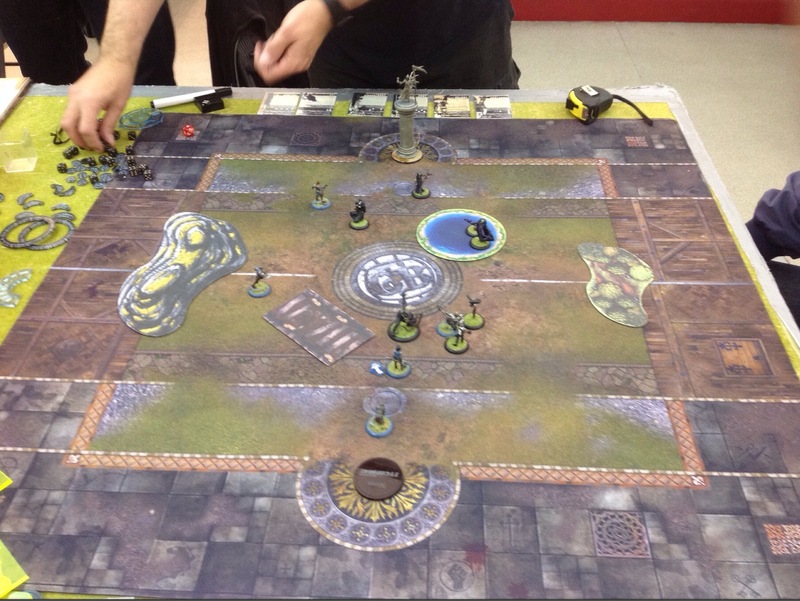 New Warmachine Mk3 is here, so to kick things off here’s a small battle report. Fellow Jock in exile Iain has his shiny new Khador battlegroup to try, so to keep things interesting I borrowed his Cygnar. New boy Lord Kozlov takes the field with his retinue of stompy Khador heavies, while veteran of the Cygnar army Commander Striker leads his trusty squad of Light Jacks to battle. Striker powers up his Jacks, hands out his buffs and advances up. Arcane Shield goes on the Lancer, Snipe on the Charger and Blur on the Hunter. The Jacks all run to position. Kozlov throws out Tactical Supremacy, Fury and puts up Chosen Ground. 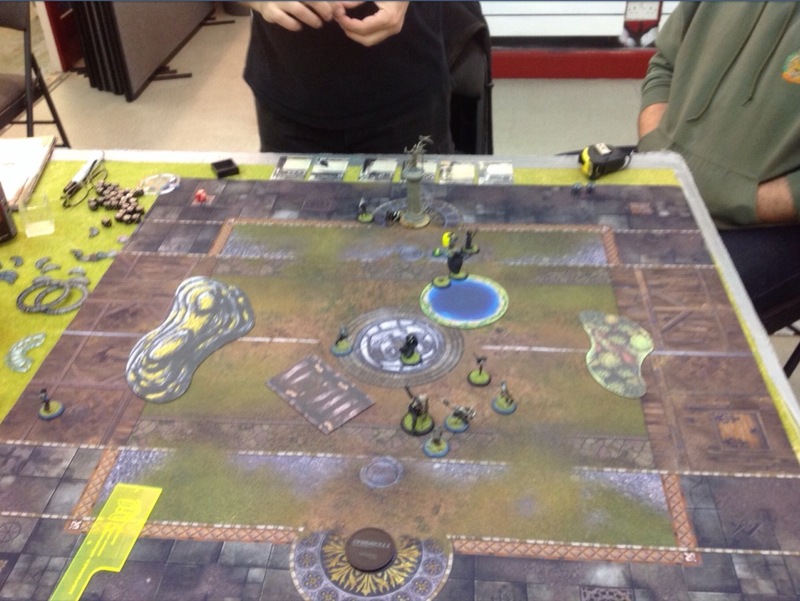 The Juggernaut advances, and the Decimator walks up and shoots the Def16 Hunters gun off in one shot! So much for Khador Jacks being rubbish at shooting. 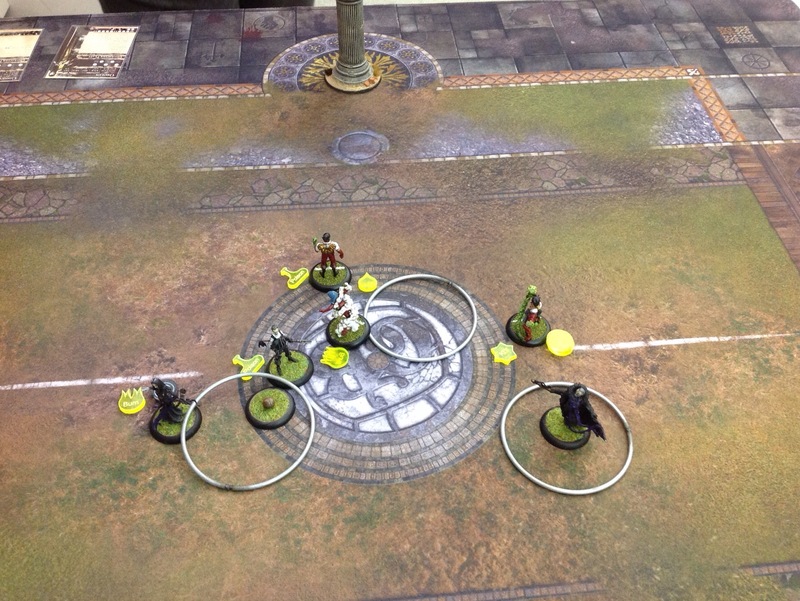 Striker upkeeps his spells and puts Snipe on himself. Advancing up he shoots the Decimator, Disrupting its Cortex. He then Feats. 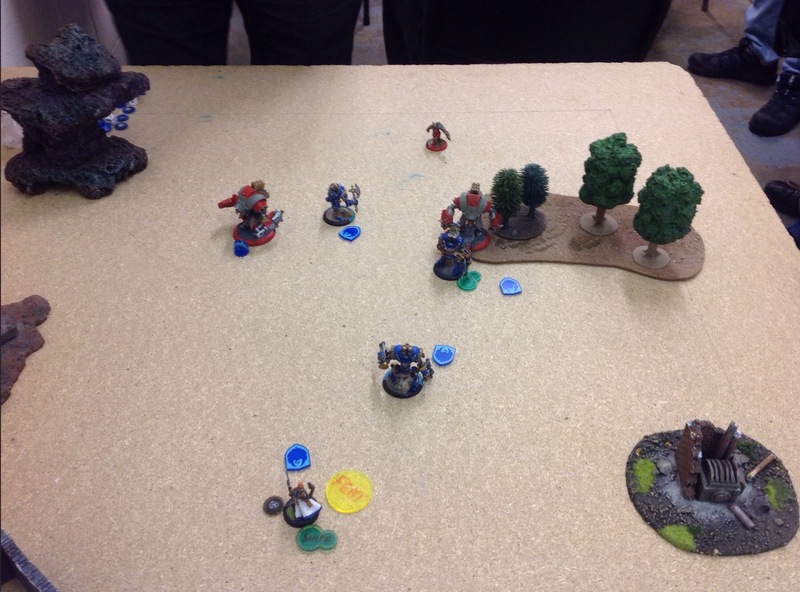 The Hunter runs towards Kozlov, avoiding Freestrikes and the Lancer walks up to the Juggernaut and attacks. Two initial attacks and a bought attack do very little, although the Shock Shield does 2 damage to the heavy’s Cortex. The Lancer takes a pot shot at the Decimator and skuffs the paint. 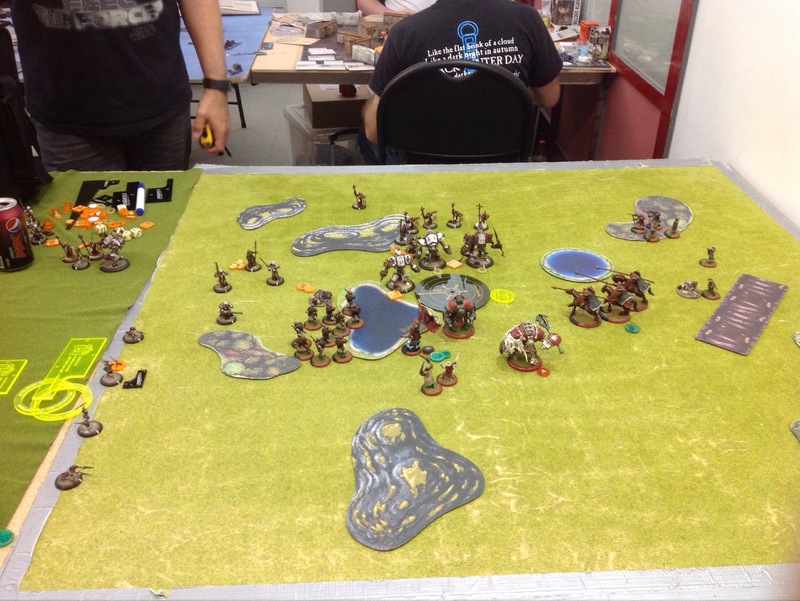 Kozlov and the Disrupted Decimator turn their combined attention to the Hunter, but fail to wreck it! Meanwhile the Juggernaut decides to deal with the surprisingly well armoured Light by lobbing it away. Luckily the Charger is out of range but the Lancer is Knocked Down. Upkeeping Snipe and Arcane Shield, Striker Disrupts the Decimator again while the Lancer gets up, advances and smacks the Juggernaut with its Shield, neatly taking out the Cortex. Meanwhile the Hunter has a go at Kozlov, but with no Cortex fails to connect with its single attack. Meanwhile, the Charger puts 2 fully Boosted shots into the Decimator for minor damage. No Picture This Turn! Bad Mike! 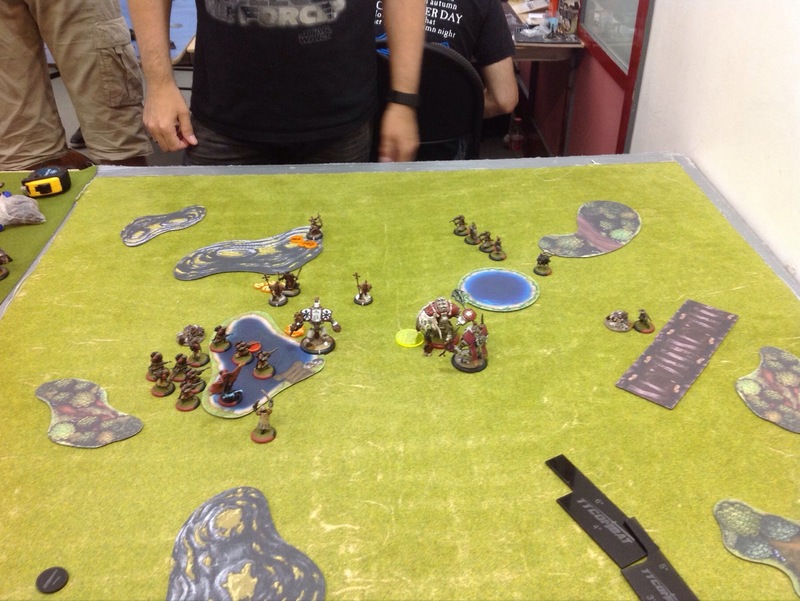 The Decimator takes out the Hunter, even with no Focus, leaving Kozlov free to charge! He Feats and goes straight for the Charger, and spends his Focus trying to take it down. Even at Pow12 with a Weapon Master Precision Strike axe, the plucky Light Jack survives. The Juggernaut gives the Lancer a pounding, but it remains standing. Ok, the boys in blue need to finish this now. Striker can keep Disrupting the Decimator all day but there is no way he can take down Arm22 heavies with a bunch of lights. But he can see a way to end it by cutting off the head! Up keeps dropped, as he needs all his Focus. The Charger move to the side and swings its hammer to little effect. The Lancer tries to leave combat with the Juggernaut but the Freestrikes neatly amputates the Arcnode, which is exactly what I do not want! So instead he casts Earthquake at the engaged Kozlov. Of course he misses, but the scatter is good and Knocks Down the opposing Warcaster (and his Jacks but who cares at this point)! Striker charges and with his last Focus points buys enough attacks to take him out! Very enjoyable game, although I don’t think I’ll be switching to Cygnar any time soon. I’m enjoying Mk3 Khador too much! This game really showed how effective Arm20 can actually be when it’s backed up by MAT7 to get some work done in combat. I simply could not do any decent damage to the Jacks, although I could minimise what they could do by damaging/disrupting Cortexes. I may have to try this again in the future, although I may try to get a heavy in. 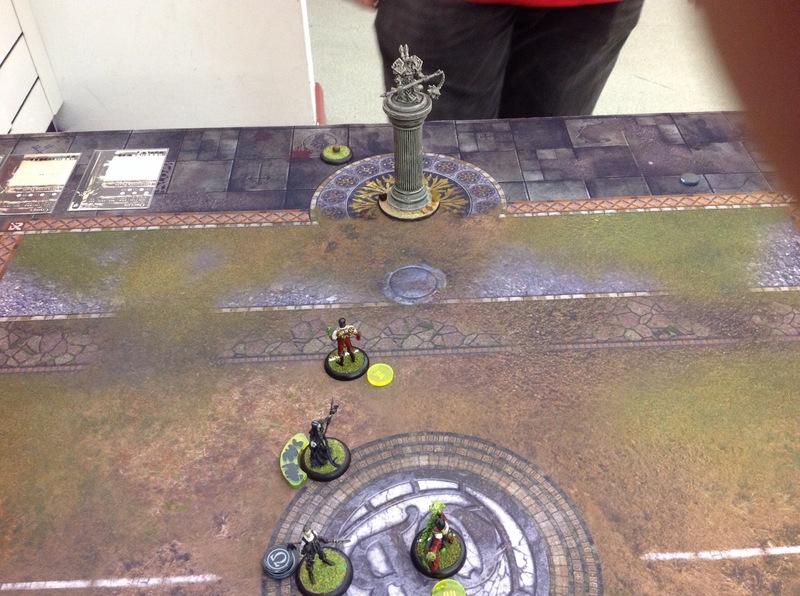 I’m not sure all Lights is the best plan against Khador. I have no idea how Trollbloods are meant to do it with their Battlebox! That’s it for now, but I plan to get some more reports up in the near future. I will also ask Iain if he wants to add his own thoughts to this report, although it was a wee while ago now we played. 3 years? Has it really been that long? Regardless, something stirs in the warp. Stay tuned.